Meet The Locals: Happy Critters Ranch | food.heal.thrive. I am currently studying to become a Nutritional Therapist and one of my homework is to do an outreach community project. Such a great coincidence! One of my personal goals for 2016 is to build a series of shopping lists, centered on our local producers and small businesses. In the next few weeks, I’ll be gathering information on local producers so if you know a great small business, please contact me! Of course, it has to be food related. On Wednesday mornings, right after tennis, I love to go to our Uptown Greenwood Market. It’s currently residing in cute little cabins by the train tracks until the new covered market will be completed, around January 2016. This is where I met Helen Daugherty, from Happy Critters Ranch, hailing from Honea Path. Happy Critters Ranch is a family operated and sustainable farm, rotating livestock and poultry from paddock to paddock, the best way to promote landscape healing and nutritional superiority (this concept is taught by the awesome Joel Salatin from Polyface Farms in Virginia, though I have no idea if Helen and her husband Rob learned through him or through hereditary wisdom). Animals and green pastures feed off one another, without the aid of antibiotics, growth hormones or cheap feed. The meat produced is high quality and promotes high nutritional content and low inflammatory risks. And it doesn’t have to travel very far to get onto your plate. Happy Critters Ranch offer beef, pork, chicken, eggs and turkey. Two weeks ago I ordered my Thanksgiving turkeys from Helen and picked them up fresh at the market on Wednesday. On the small side, which suited my needs, the meat was excellent and juicy. No dry turkey on my table! 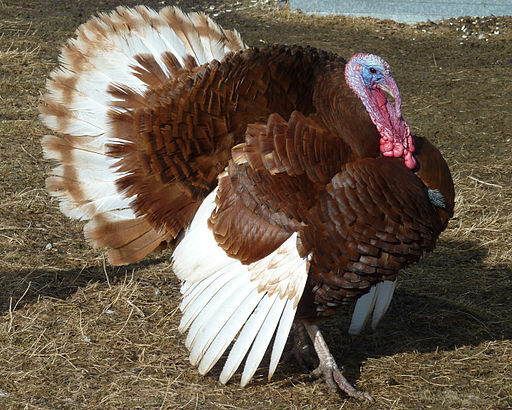 These Red Bourbon turkeys were raised on the ranch, free ranging on pastures and in woods. In comparison, they were NOT intra bred to produce a heavy breast, which makes it almost impossible to walk, they were NOT caged wing to wing and they were NOT fed an unnatural diet of GMO grains and antibiotics. They were more expensive than the 0.99¢ a pound special at the large grocery chain, but I value the care and quality Happy Critters put into their craft. Tonight my husband will smoke the second turkey and I hope there’ll be more leftovers than when I roasted it on Thursday. This turkey is delish! Contact Happy Critters for well raised beef, poultry, eggs and pork; buying from sustainable farms allows farmers to continue growing quality meats and it’s also much better for your health. Happy Critters Ranch, 664 Brock Rd, Honea Path, SC, 29654, 864-314-4019. Email: info@happycrittersranch.com. Helen is usually at her post at the Uptown Market on Wednesdays, from 10 till 2. It will take some time to build up my local shopping lists but to make sure you don’t miss them, sign up for my newsletter (form is on the sidebar). I promise I won’t inundate you with emails, only with the best, fresh and local news possible. Hi, Carole! I am thrilled for you (and, for me) on this new and exciting profession. Your passion for and curiosity about eating healthy are two–of many–things I’ve long admired about you. My fridge had never been as healthy and happy as when you visited me in Texas.